Winston’s birthday was a spectacular event at Sentosa private beach , this year his theme was a safari based concept , therefore our team decided to use colours that represented “safari”. 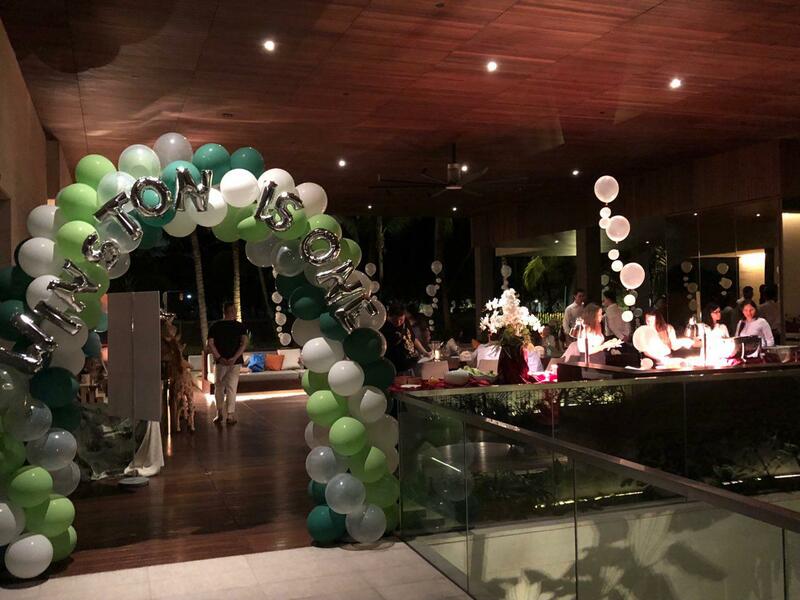 Using colours like green, white, clear , we did up a few balloon arches and columns as well as some animal walking pets around the whole event area. We also provided customised balloon printing and bubbly streamers . Whats more we also have a professional sound system on hand which provided music and entertainment through the whole night, and yes the guest had and enjoyable birthday party celebration. Ball pits are small , safe for the kids and fun at the same time . Parents can actually leave the kids to have fun at the pits while they head to catch up with their friends . We deemed safety because they are low , small and also reduced the chance of someone getting injured. Overall our team enjoyed ourself through the phrase of setting up and also the planning stages . Once again Happy 1st Birthday Winston.